Tarita is a German Frers designed 44 feet Ketch.The model is called F&C 44(Frers and Cibil),and slightly over 50 of them were built on the Frers shipyard in Buenos Aires(as a cooperation between British and Argentinians).The Ketch version is built for cruising but has the pedigree of a racing hull.Her sail area is 75 squaremeters,and she also has the ability to fly a mizzenstaysail.She´s powered by a 50 Hp Perkinsengine which was recently completely overhauled. Tarita was originally owned by an Argentinian gentleman who named her after his grandchild Sara.Sarita in Spanish means “little cute Sara”,but since little Sara couldn´t pronounce S,she called herself Tara.From there came the name Tarita(this is the story we have been told many years later).In the early 90íes,Tarita was sold to an Argentinian tennispro in Puerto Banus in Spain.He upgraded her considerably but had to sell her due to financial circumstances.She was then sold to a Dutch family,and we bought her from Lymington in the UK 1999,and sailed her to Sweden May 2000. 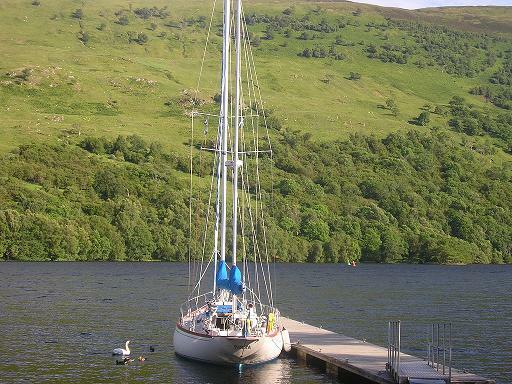 Since then we have sailed her every summer with our 3 children, among other places to the westcoast of Norway 2003,and Classic Malts Cruise 2005.